Our day got off to a bright start. We woke up at 7:30 am, by far the earliest that we had risen on this trip. By 9:00 am it seemed we were ready hit the road, that is, until I checked the pressure of my rear tire. The tube had gone totally flat. I spent a good 45 minutes repairing my tube. The task was made even more onerous by the residual dirt caked on my bike from yesterday's ride. I discovered that this puncture had been a result of having not properly repaired a previous puncture in my tire. After patching the tube and using duct tape to seal the interior of my tire, my bike was road-ready. Today's weather was much nicer than yesterday's. The sun was out, the clouds were gone and there were only a few puddles left over from the rain. Additionally, I sapped all the moisture from my gear using the hair dryer at the Bavarian Inn. 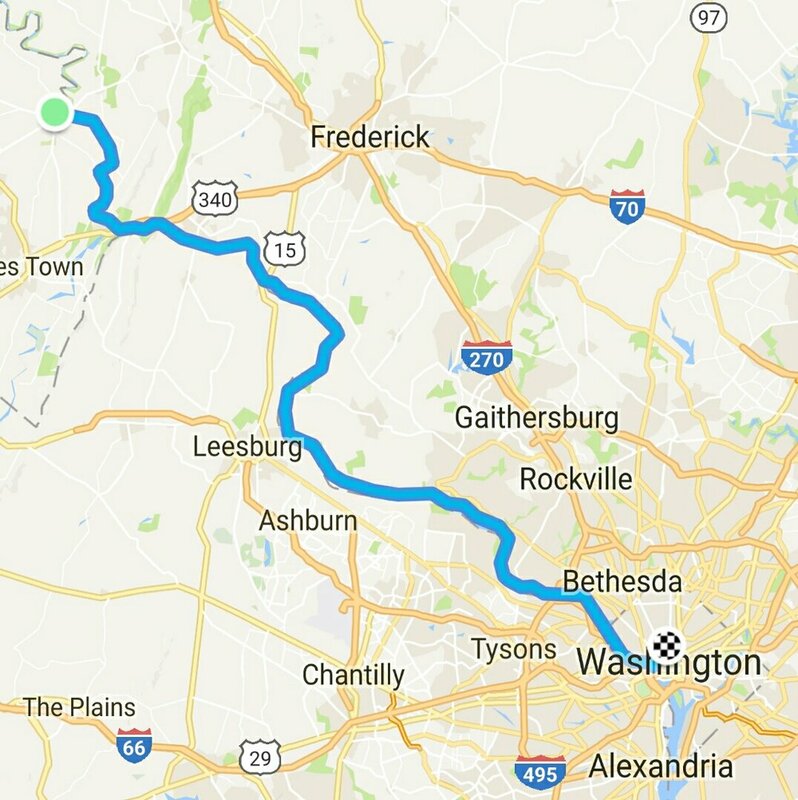 I was in a good mental place as I completed the thirteenth mile of the day's ride, bringing me to historic Harpers Ferry. The guys crossed the bridge to get lunch, I hung back to watch our gear. Being the team players that they are, they returned with a cone of chocolate ice cream for me. Today's ride would be the longest of the tour. Each of the two previous rides were almost exactly 56 miles. We intended to go further yesterday, but our plans got rained out. This meant that we had about 73 total miles to arrive at the terminus of the C&O Canal on the Georgetown Waterfront. Luckily the wind was behind us as we made our way along the great Potomac. As I watched the Potomac, I wondered about rivers. I would proudly look upon the Potomac, the river I identify most with, and think about the other great America rivers. There was the Mississippi, the Columbia (which I hardly knew existed until I stumbled upon it on the Lewis and Clark trail), the Colorado, the Missouri...this country has lots of great rivers. Even a state as boring as Delaware has a great river named after it. Yup, I was just sitting on my saddle, mentally listing off all the rivers I knew, and I couldn't have been much happier. For most of this stretch I had the sensation of being in a tunnel of trees. On occasion I would cruise through pretty stretches of lavender flowers or catch a glimpse of Paw Paw plants which Nikolai, the son of a scientist, was eager to photograph. We were all pretty immersed in our scenery on this homecoming ride. At White's Ferry, the halfway point of our ride, Sam's parents came out to cheer us on. I couldn't believe that it had been nearly a decade since I had seen them, it was quite a reality check and reminder that time keeps on ticking. They brought us PB&J sandwiches, oranges and brownies, which we devoured. Both of Sam's parents seemed to be in good spirits. Nike and I peddled ahead of Sam who was engaged in conversation with his parents. When we arrived at Great Falls, about 15 miles from our destination, we waited up for Sam, but to no avail. We speculated that maybe they got lost in conversation. After hanging out for a half hour, we decided to finish up the journey. About four miles from Georgetown, the C&O Canal intersects the Capitol Crescent Trail. Desiring to be purists, we opted to stick to the C&O Canal, though it is not paved like the Capitol Crescent. At about 7:00 pm we arrived at the graffiti-covered Georgetown loading dock, Sam followed about ten minutes later. So that was it. In three days we covered the 185 miles of historical C&O Canal. You know, for as giant as Washington, DC can feel at times, it sure didn't feel like much of a force when we were out meandering the foothills of Appalachia and gliding along the great Potomac. As easy as it was for me to feel stuck in the metropolis, it was just as easy to find a way out. © Colin O'Laughlin and www.memybikeandacamera.com, 2016. Unauthorized use and/or duplication of this material without express and written permission from this site’s author and/or owner is strictly prohibited. Excerpts and links may be used, provided that full and clear credit is given to Colin O'Laughlin and www.memybikeandacamera.com with appropriate and specific direction to the original content.